Generally, computers are infected with malware through an internet download of infected files or via attachments in the emails. Besides this fact, an infected USB flash drive can also act as a medium for infection. Malware is malicious software created by a hacker for malicious purpose. The main aim of a hacker is to take control of the victim’s computer to perform malicious activities like DDoS attack, mining Bitcoin and etc. The growing trend of hacking popular websites is to gain administrative access for spreading malware and injecting exploits. This method puts aside the usual hacker requirements of internet bandwidth and processing power for propelling the malware into numerous devices. Hence, netizens who visit the popular website get infected automatically without the hacker taking any strides for making it happen. AntiVirus software is devised to ensure safety by scanning the downloaded files and URLs that users visit. However, for some reasons the URL scan option remains uncared-for in many systems. This provides an opportunity for hackers to creep into the systems. Comodo is a well-known company that offers antivirus, internet security services to end users and enterprises. Web Inspector is a robust blacklist monitoring service offered for websites. It is a cloud-based service that can perform URL scanning to identify malicious codes and viruses. 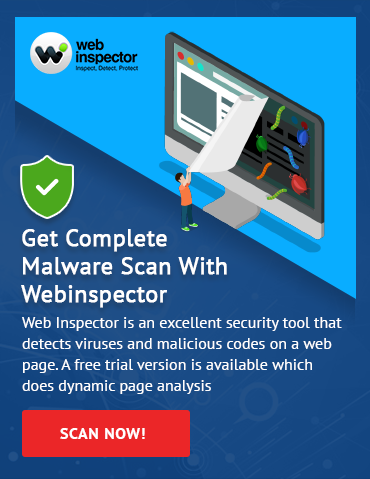 Unlike other famous URL Scanning websites that use other sources to scan, Web Inspector uses their own propriety method for detecting malware. The Comodo URL Scanner requires you to enter the website URL, Name, Email address, Phone number and then click on the ‘Get Started’ button. On a regular basis, it monitors the website for blacklisting and instantaneously reports it to the website owner when such details are uncovered to prevent blacklisting. VirusTotal is free for non-commercial use and it works on the aggregated data model. Users can upload any file to have it inspected with over 70 antivirus scanners and use the URL scanner using 63 different link scanning services. Simply, go ahead and enter the URL in the space provided under the URL tab and click “Scan it!” to run your website scan. You may notice that the time taken to complete scanning a URL is less. By checking all the latest virus scan reports of URL scanning services with over 60 other services, VirusTotal detects the malicious software. Ideally, it is apprehensible that not all scanning services show the current scan results at the time of request. VirusTotal is free for non-commercial use and its servers are hosted under Google’s infrastructure. URLVoid is also a link scanning website which offers free service to analyze website through multiple blacklist engines. Similar to VirusTotal, simply enter the domain name in the box and click the ‘Submit Now’ button. After the scan is completed, the results are accompanied by additional information such as Alexa Traffic Rank, server location, and Google Pagerank. URLVoid is supported by 29 URL scanning engines and it is efficient enough to provide an exceptional report with additional details.